SmartSynch says its new router can adapt to network protocols and standards. Will this put utilities at ease? It's sort of like an everything box for the grid. 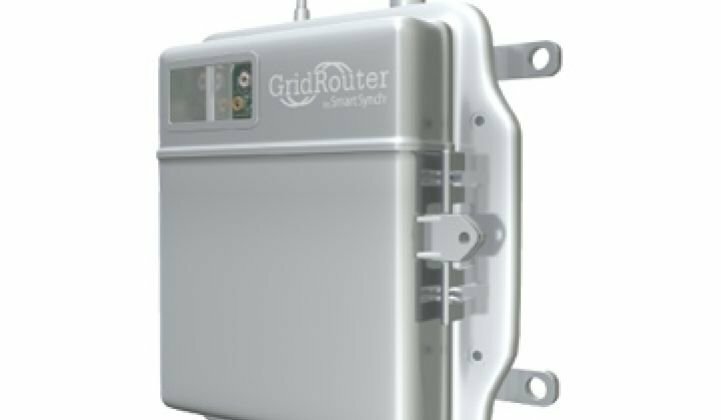 SmartSynch today unveiled the GridRouter, a modular, standards-based networking device that can handle virtually any communications protocol a utility wants to throw at it. And, because it can be upgraded, it lets utilities avoid the risk of standards wars. Four networking card slots allow a single box to handle, for example, ZigBee, WiFi, WiMax and other proprietary communications standards at once. The cards can be removed so utilities can swap out and/or upgrade their networks without replacing the basic piece of installed equipment. Ports also allow utilities to connect it to wired and optical networks. "It provides communication to any device on the grid over any wireless network," said Stephen Johnston, CEO of Jackson, Miss-based SmartSynch. "All you have to do is replace the card and you are running 4G. This really opens it up [smart grid] to the AT&Ts and Verizons," he added. The device also runs Linux and IPSEC-based security. SmartSynch will post the APIs, thereby allowing third-party developers to write applications on top of it. When it moves into volume production, the GridRouter will cost about $500. The flexibility makes it akin to a networking router or a PC, a platform-like piece of hardware that can change personalities and capabilities as economic circumstances and technological changes around it. Potentially, that could eliminate some of the fear and uncertainty surrounding smart grid deployments. Although utilities want to add intelligence and communications to their grids, they are also generally afraid of being locked into protocols that could become outdated, run out of bandwidth or fail to adapt to new levels of security. Meanwhile, smart grid vendors such as SilverSpring Networks and GridNet often argue over whose equipment is built around the most advantageous protocols. Will other companies release similar devices? No doubt. Cisco likely has a small army of engineers developing similar devices. SmartSynch, though, has a lead for now in part because of its history, according to Johnston. Established networking companies that make standards-based equipment are only now moving into the utility market. By contrast, most smart grid vendors have built their equipment around closed, proprietary networks. SmartSynch has been sort a hybrid. Since 2000, the company has specialized in utility equipment based on IP networks. In other words, it knows the technology and understands the particular psychology of utility executives. "Our specialty is connecting to commercial networks," he said. So far, SmartSynch has tested the device with five of its utility customers. One has ordered 5,000 and another will soon order a large number of them. SmartSynch works with around 120 utilities nationwide. SmartSynch will sell the product directly and through partners. The device will also allow the company to expand overseas. Right now, SmartSynch only sells in North America. Photo of the GridRouter via SmartSynch.